High-quality award-winning Multifunction Copiers and Fax Machines from Muratec. Fast, reliable and easy-to-use, these copiers and fax machines are ready to help your business. Plus, they are expandable; they can grow with your business! 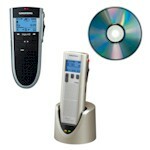 Increase productivity with professional Digital Dictation Solutions from Grundig and Philips. Whether in the office or on the road, there is a dictation solution for you! Easy to setup and simple to operate in conjunction with your computer, these devices will save time, and money! From Grundig and Philips, two of the most experienced and most trusted manufacturers in dictation, comes the latest in analogue dictation. The desktop and portable units are well built, reliable and feature high-quality recording thanks to level control and dynamic noise suppression. Combining high functionality with innovative design, we proudly offer a variety of Adler-Royal calculators. Sleek, stylish housings on heavy-duty construction will hold up in any high-paced work environment. Royal's Cash Register line leads the industry with its full range of cash registers at affordable pricing and proven reliability. Royal Cash Registers offer flexible benefits to suit most business owners' cash management needs. The Kobra+ Paper Shredders are built environmentally friendly so they save money and help to protect the environment. High capacity trimmers equipped with a special sharpened carbon steel blade unaffected by the wearing action of the materials to cut, for long-lasting cutting operations with the same cutting precision through the years. High performances guillotines equipped with the innovative "SUPER CUT" system featuring special carbon hardened steel blades and counter-blades unaffected by the wearing action of the materials to cut, for long-lasting cutting operations with the same cutting precision through the years.